My family faced a serious struggle when I was growing up. We had to rally and find strength in each other — but we made it through, together. I grew up with a left-handed mother. My siblings and I didn’t understand her plight when we were young. Like so many, we were blinded by our Right Privilege. As I grew older, I began to understand. I watched my mother struggle with pencil sharpeners, notebooks, coffee mugs and atrocious penmanship. And if I didn’t watch it directly, she was sure to tell me about it. But you’re not alone anymore. Now you can join the Left-Handers Club. 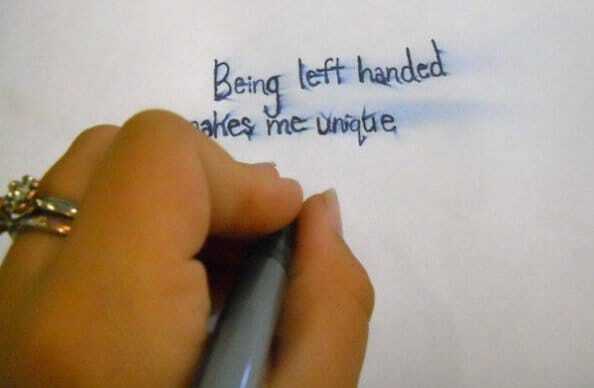 The Left-Handers Club offers resources for teachers and parents through its website, LeftHandedChildren.org. It shares information and advice to help left-handed children through school and at home. In association with Anything Left-Handed, LeftHandedChildren.org also offers products to address the inconveniences and annoyances faced by southpaws throughout history. When you join the Left-Handers Club for free, you’ll get to download the signature Backwards Calendar for left-handers. As its name suggests, this wall calendar presents the months and days of the week in reverse order, so you don’t smudge important dates with your antipodal hand. Need more than a free wall calendar to overcome the barriers of left-handedness? If you’re headed to college in Pennsylvania, apply for the Left-Handed Scholarship! Your Turn: Have you experienced left-handedness in your life? What resources have you found to cope?